Del Mar Thoroughbred Club has announced that this year's TVG Pacific Classic Day will be held on Saturday, Aug. 17, as part of an enhanced racing program that will feature an unprecedented five graded stakes races, the first time that will have happened in the seaside track's 80 summers of racing. Del Mar's 29th edition of its signature race – the $1,000,000, Grade 1 TVG Pacific Classic — will headline a blockbuster program that also will offer four additional Graded stakes – the $300,000, Grade 1 Del Mar Oaks; the $250,000, Grade 2 Del Mar Handicap; the $100,000, Grade 3 Torrey Pines Stakes; and the $100,000, Grade 3 Green Flash Handicap. Tickets for the Del Mar season – including Pacific Classic Day — will go on sale on Friday, May 10, at 10 a.m. (Pacific). The TVG Pacific Classic, which has been won recently by such champions as Shared Belief, Beholder, California Chrome and Accelerate, is run at the classic American distance of a mile and a quarter and open to 3-year-olds and up. Approaching its third decade, it has established itself in the top tier of races nationally and continues to be the west's only million dollar test for older horses. The Del Mar Oaks is for 3-year-old fillies and run at nine furlongs on the grass, using Del Mar's distinctive infield chute. This will be the 63rd edition of the headliner that annually draws top-clas fillies from across the country. The Del Mar Handicap is the track's oldest stakes race, presented first at the opening meet in 1937 and every year since. This 80th running goes at 11 furlongs on the lawn for 3-year-olds and up. The Torrey Pines Stakes is also for 3-year-old fillies, but it is a main track offering run at a mile. This will be its 42nd edition. The Green Flash Handicap was recently elevated to its current Grade 3 status after being first presented as an overnight stakes starting in 2003. This 17th running is for 3-year-olds and up at five furlongs on the grass. The full Del Mar summer stakes schedule will be released at a later date. Del Mar's 36-day summer season will run from Wednesday, July 17, through Labor Day Monday, Sept. 2. Racing will be conducted on a Wednesday through Sunday basis throughout the stand, along with the addition of the closing holiday program. 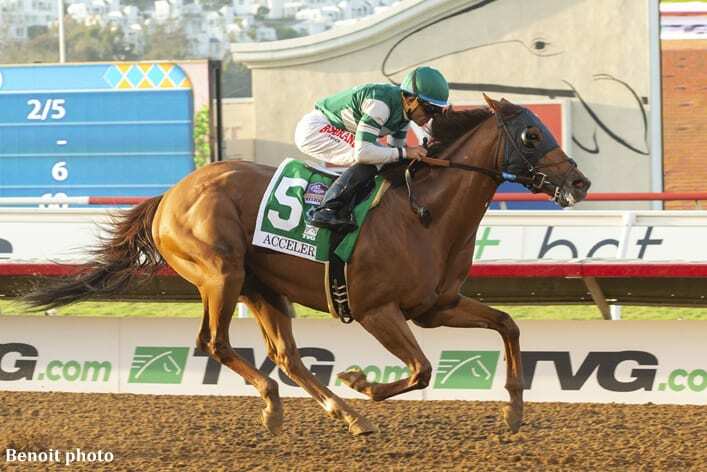 This entry was posted in The Biz and tagged Del Mar Handicap, Del Mar Oaks, del mar thoroughbred club, green flash handicap, Josh Rubinstein, pacific classic, pacific classic day, torrey pines stakes by Press Release. Bookmark the permalink.